Owning land has always been part of the American Dream. For many, homesteading was an opportunity that could not be missed. It was a chance to claim property without having to have a lot of cash. Many of us are fond of the stories that begin something like this: "The family spent the first year in a sod hut, on the plains of South Dakota, barely able to walk outside for the depth of the snow..." Those stories make for a grand adventure, but are they based on historical fact? 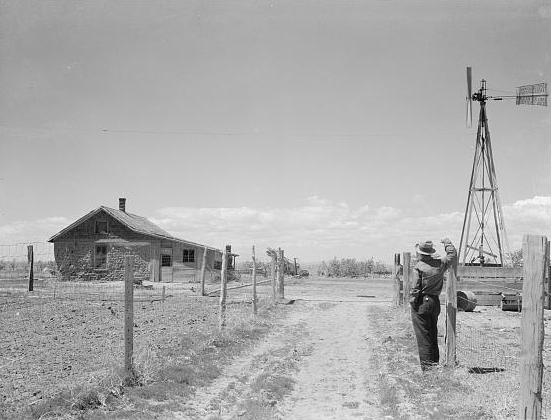 The Homestead Acts initiated in the United States in the 1860s (and Amendments through the early 1900s) granted 1.6 million homesteads. It covered 270,000,000 acres - 10% of all land within the borders of the United States. The history and search process of the documents available to genealogists is outlined very well by Roberta King in her Expert Series article, "Homestead Records: A Glimpse Into Your Ancestor's Past." It was a difficult and challenging experience, and not everyone was successful. Approximately 40% of those that filed a claim were able to see the commitment through to the end. The question begs to be asked: How did they do it? What was life really like? Your ancestor might have never written down a single memory from the years as a homesteader, but many others did. The trick is to identify resources from the geographical area you are interested in and then to broaden your search to include contributions from a variety of sources in that area. Although a woman's diary may not include the name of your family member, it may give you a unique look at the life led in that area during that time frame. What kind of information might you gain? Letters of a Woman Homesteader, written by Elinore Pruitt Stewart (Houghton Mifflin Company, First Edition, 1914), tells us of life on a Wyoming homestead ranch. She describes how she can gain goods and food, describes her continued use of a corset, and talks about how rare a fireplace can be to that part of the state. She details how the men of the area are lonely, "awkward and embarrassed" when seeing other's after being alone for months at a time on their property. She describes her participation in conducting a funeral for a child when no minister was available, canning peaches, and using sleds and snowshoes to travel across through the country during the winter months. She refers to "cowboys," "Navajos," and the three seasons: "winter, July and August." Simply put, she tells us in her preserved letters about life. Life as they lived it. With a little digging in the right areas, you can find many resources to add the soul into your research. Certainly not every community, county or region of the country was lucky enough to have a preserved diary or journal written just in the exact time frame you want, but there are some incredibly valuable resources available, and they come in many forms. One example is the Free Homestead Lands of Colorado Described: A Handbook for Settlers by George Clason, published in 1915. Although many of these texts were exaggerated to generate business for both the publisher and the advertisers, they can contain factual information. This particular example includes statistics of the population and borders of each county in Colorado at the time, information on the various land district offices, and a map of each land district in the state. These districts often did not coincide with county borders, so it's it important to understand that although someone may have resided in Cheyenne County, Colorado, they could have been located in either the Hugo Land District or the Lamar Land District. The records for each of these districts are held in differing offices. The statistics and the memoirs combined can produce an in-depth view of life as it was. Let's look at the situation one Richard P. Snodgrass may have found himself in when he filed his agricultural claim in Gilpin County, Colorado on 13 Jul 1873 for 160 acres. His situation is a bit different than those that settled in the plains; he was in a mountainous region, with an established community relatively close by. He still would have had to work extremely hard to develop his land and fulfill the requirements of his agreement, however. To really understand how he was able to improve upon his land, we must understand the history of both Gilpin County and that of what was then Colorado Territory. Gilpin County began as one of the original seventeen counties of Colorado in 1861 and has always covered a very small section of the state's land. When Mr. Snodgrass established his claim, Central City, the closest major community, had previously been an established stop for the Central Overland, California and Pike's Peak Express Co., on the stagecoach lines. By 1873, Wells Fargo had control of the area, and many of the major routes in Colorado, and stopped in nearby Golden and Idaho Springs. This meant that travel, ordering of supplies, and other "out of town" services was expensive and at times difficult to obtain, compared to the relative ease of railroads. The 1870s brought continued growth of the railroad in Colorado, and Central City was on the Colorado Central route, beginning in Denver and climbing into the mountains on a narrow gauge track. The population of the county in 1870 was 5,490 people, and had developed a trend of increasing that number each decade through 1910. At an elevation of 8,496 feet, Central City is certainly not the highest community to see homesteaders, but for those coming from the eastern states, that was quite high enough! With an average of 73.8 inches of snow each year and winter temperatures dropping into the range of -30°F, how did these early residents actually survive? Hastily built cabins were the most common form of protection from the elements, but some were known to shelter inside the depths of their mining pit, even thru the treacherous mountain winter. The higher elevations saw changes in architectural design to the typical homestead cabin, with many installing a door in the roof for use in winter. As snow accumulated, they would forego shoveling it away from their doorway, for "real work" and just use a ladder and the roof door to enter and exit. Generally, cabin interiors included what they could carry with them, after they finally reached Denver, and headed into the mountains. Most common items, such as trunks, were retrofitted to become furniture. Heat sources varied, but this aspect was certainly made easier by the addition of the railroad, and the Sears and Roebuck & Co. catalog, which started carrying stoves as part of its inventory in 1895. Other questions we might ask on behalf of Richard Snodgrass would be whether or not the community had a general store, and if so, was it well stocked? How many saloons did the town hold, and did they take precedence over the post office, banks, doctor's offices or other businesses? Were there other agricultural claims in the vicinity, or was he isolated among the many miners and shop keepers? Did he have family nearby; did he already have established acquaintances in Central City when he arrived? What did he grow or raise on his claim, and how did he transport his goods for commerce, especially before the arrival of the railroad? Finally, was he successful in improving on his claim and taking full ownership of the land? For a more personal look at homesteading life, read through the series of essays available on www.pbs.org, which were written for the series "Frontier House." The site introduces the writings with the following statement: "...we have pieced together diaries, letters, newspaper articles and official documents to give us a window into the day-to-day lives of settlers who actually lived on the American frontier." The quote should also lead you, the researcher, to a variety of resources currently available for your own personal adventure into the life of your homesteading ancestor. One of the most important elements in social history research is creativity; if you can think of it, it just may exist. If it exists, it is a possible source for your journey back in time. A sod homestead built in 1900. Pennington County, South Dakota. Image courtesy Library of Congress Prints and Photographs Division, Washington, DC.